While Level 1 is the foundation for C.A.L.M., and Level 2 is needed by 90% or more of the people who need help with asset protection. Level 3 is needed by the vast majority of C.A.L.M. Plan members who not only want to protect their assets, but also want to grow their assets so that they can eventually retire. A comprehensive program to help clients reach critical capital mass (CCM) in the quickest manner possible. CCM is a point in a client’s life where he/she does not have to worry about making more money and can retire at any point going forward and live a desired lifestyle. It sounds simple but few clients ever reach CCM. Do you need Level Three? Do you have a complete game plan to get you to retirement without worry by having your assets protected and doing so in the most tax favorable manner possible? Has your CPA, accountant, attorney, and financial planner sat down in one room for several hours to put together for you a “comprehensive” and “coordinated” estate, financial and tax plan? If you have not been given a 30-50 page summary of your estate, financial and tax problems and the solutions to those problems, then you do not have a comprehensive and coordinated plan. If your attorney and/or CPA/accountant and/or financial advisor have NOT discussed with you the following topics, you are in need of Level Three. –Freeze Partnerships (how to obtain upwards of a 90% discount on a Family Limited Partnership (FLP) for estate planning purposes). –The Maximizer (how to nearly double the return of the S&P 500 while principally protecting 90% of your invested assets each year). –Carve-Out Planning (how to implement a qualified plan in the most discriminatory manner possible). –Leveraged Bonus Plans (deferred compensation for key executives). –Qualified Pension Insurance Partnership (how to mitigate the double tax of money in a qualified plan or IRA). –Life settlements (how to sell a life insurance policy that is no longer needed for much more than its cash surrender value). –Indexed annuities (a deferred investment tool where your money is 100% protected from downturns in the market with upside growth pegged to the S&P 500). –Durable powers of attorney (medical and legal) (use to avoid your family having to go to court to obtain legal powers to act for you if you become incapacitated). –Living Trusts (to avoid probate and minimize estate taxes). -An irrevocable life insurance trust (to make sure the death benefit from your life insurance policy passes income AND estate tax free). -A traditional Family Limited Partnership/FLP (to discount the value of your estate for estate tax purposes). If your local asset protection attorney, accountant and financial advisors have met with you and provided you with a comprehensive plan that includes discussions of all of these legal tools and incorporation of all the above mentioned topics, then you probably do not need Level Three to help you reach CCM. Are you and your family important enough to have a complete and comprehensive financial and estate plan? For most clients with wealth the answer is “yes.” The problem is they don’t know who is qualified to give them needed advice. Through the C.A.L.M. program you will have your local CWPP™ advisor who has been trained in the topics outlined above (and many more) and certified by The Wealth Preservation Institute. This local advisor (through their affiliation with The Wealth Preservation Institute) will have access to nationally recognized advisors who are experienced and certified specialists in their field. Through a collaborative effort, the team will put together for you a complete program ready for implementation. What does a complete plan normally costs? The answer is typically between $10,000-$20,000. 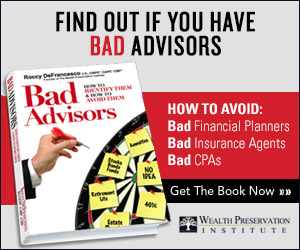 The problem with the question is there are few advisors in the country who can offer a complete, comprehensive plan and advice. So, for $10,000-$20,000, most clients get a run of the mill plan. Most clients simply don’t know any better (even if you live in a large city and went to a large law firm or CPA firm). Through the C.A.L.M. program you can receive this comprehensive plan for $7,500 which will be ready for implementation when you say the word. Is your wealth and your family worth Level Three protection?